Afternoon class cancellations…All schools in Elgin are dismissing early today due to icy conditions. Schools will let out at 2 p.m. and buses will run accordingly. According to school officials, the EPPJ Wolfpack girls basketball game against Ewing scheduled for tonight has been cancelled. Tomorrow’s Neligh-Oakdale Wrestling Invitational will be pushed back in time. Weigh-ins are now set to begin at 10 a.m. with action hoping to begin at 11 a.m. 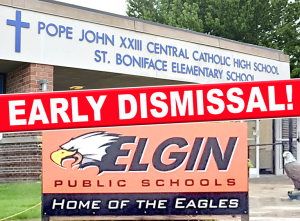 Initially, a significant amount of snowfall was predicted for the Elgin area today. As the day began, ice and sleet quickly became the major problem. Streets, sidewalks and vehicles are coated with ice and the ice accumulating on windshields are hindering visibility for drivers.